A few of my neighbors hired a swim instructor to come in and give the kids swim lessons at our neighborhood pool. Big E is almost four and I feel like there is no time like the present to tackle this. For the most part, Big E is a big fan of the pool. He has no problem putting his face in the water and blowing bubbles. I assumed swim lessons would be cake. The first warning shot came via a text from my neighbor whose son had the first allotted time slot of the day's lessons. I tried to remain upbeat as I dressed Big E and lathered him with sunscreen. By the time we arrived at the pool, our neighbor was finished with his lesson. His mom reported he had yelled for a good fifteen minutes. I was still holding onto hope that Big E would be a superstar student. But the nagging doubts I had been ignoring were bubbling to the surface. The teacher took Big E and explained to him how everything was going to happen and went through a book about a duck learning to swim. She also told me not to be alarmed by the crying. It was very normal. WHO ME? I'M NOT THAT CRAZY, OVERPROTECTIVE MOTHER. HE PROBABLY HAS A GOOD DUNK OR TWO COMING TO HIM, ANYWAY. I took Little E and went to sit in the covered patio area, a ways back from the pool. It took one dunk from Ms. C and it was over. He began crying. It quickly escalated to shrieking. I WANT TO GET OUT OF THE POOL! His wails echoed throughout our unfinished neighborhood. My mommy instinct implored me to dive into the pool and save him from this mean, dunk-happy swim instructor. I tried to keep myself busy with Little E. He was busy eating crumbs left on the table by prior pool guests. I can always count on him to need some parenting. I thought back to when I learned to swim. 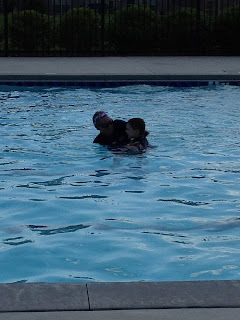 I vaguely remember it, but I'm pretty sure I wasn't being pulled under in the backyard pool of my Rabbi's house. I guess if I was, I blocked it out, so that is promising for Big E.
IS THAT BIG E SCREAMING? She looked alarmed. And why wouldn't she? Her daughter was up next! The moms all discussed how we would convince our children to come back tomorrow. And Wednesday. And Thursday. And Friday. I came up with an idea tonight as I took my shower. We could rent a prisoner transport bus from the city of Atlanta. Because that is truly the only way those kids are going back to the pool. For real.